Cost shock: Even the Conservative-supporting Daily Telegraph has been complaining about high energy prices – as demonstrated by this cartoon from 2012. To borrow a favourite David Cameron phrase: Let us be clear on this – any savings on your fuel bills as a result of the Coalition government’s policy change will be added to general taxation in another way and you will still pay. Energy firms’ profits, which have tripled since 2010, will be unaffected. Cameron’s plan is akin to shifting deckchairs on the Titanic (to borrow another well-known saying). Why on Earth does he think anybody is going to be deceived by this silliness? Even with the changes in place, prices will still rise by an average of around £70, at a time when people were already being forced to choose between (let’s have yet another now-tired phrase) heating and eating. Average household incomes have dropped by nine per cent since David Cameron made himself Prime Minister by the back door three years ago. Average pay for bosses of FTSE-100 companies has risen by 20 times the rate of pay growth for most workers, just in the last year. And let’s not forget that they were getting much higher than average pay already! It should surprise nobody that all of the ‘Big Six’ energy firms are part of the FTSE-100 – or were, before foreign takeovers. This means average pay for these companies’ bosses should be around £2,321,700, while profits have risen to £2 billion – up 75 per cent on last year (according to the Independent reports). None of this will be changed by David Cameron’s measures, which were hastily cobbled together in a bungled bid to regain the initiative from Labour, whose plan to freeze energy prices and re-order the energy market has captured the public imagination. Instead Cameron – who once campaigned under the slogan ‘Vote Blue – Go Green’ – will postpone green policy targets to a later date, cutting the so-called ‘green levy’ on the energy firms accordingly. This means the UK will be forced to rely on greenhouse gas-producing carbon fuels for longer. Subsidies for people in fuel poverty will be moved into general taxation, meaning we pay for them rather than the energy firms who should. 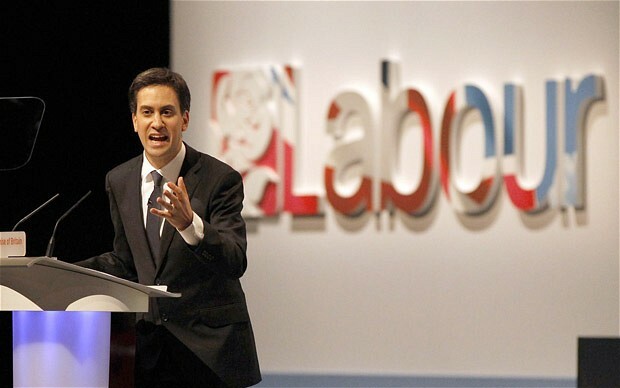 “Even after these changes to levies, energy bills are still rising and the average household will still be paying £70 more for their energy than last winter,” said Labour’s Shadow Energy and Climate Change Secretary, Caroline Flint. “Any help is better than none, but you can judge this Government by who they’re asking to pick up the tab – the taxpayer. 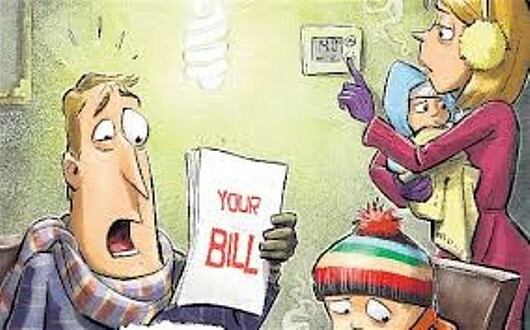 The energy companies have got off scot-free. She was expected to tell the IPPR thinktank today: “If David Cameron and Nick Clegg think just doing what the energy companies ask of them is the answer to bills being too high, they are wrong. “Energy bills have gone up by £120 this winter alone, so even with a £50 cut in levies, people’s bills will still be higher this winter than last year. The real reason bills are rising year on year without justification is because the energy market is broken. But we all know that David Cameron never stands up to his corporate masters, don’t we? 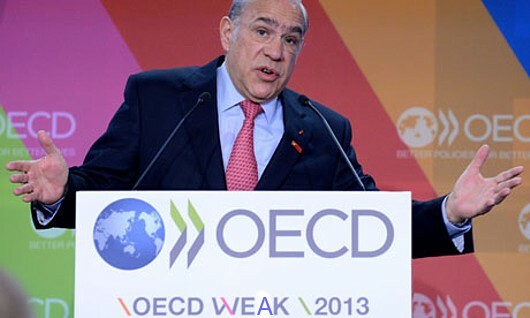 Schizoid report: José Ángel Gurría, secretary general of the OECD. He’d probably object to the way we’ve defaced his sign, but it now provides a more accurate description of his organisation’s opinions. How can the Organisation for Economic Co-operation and Development tell George Osborne that he should invest in infrastructure projects but continue with his policy of cutting public spending, when the first public spending he cut was infrastructure projects? Is this a sign of the delirium into which the western economies are sinking, partly through slavish adherence to neoliberal nonsense – in the face of all the facts – and party through a lack of raw intelligence? The OECD, according to The Guardian, has revised down its economic growth forecast for the UK. What a surprise; they haven’t revised our growth upwards since before Osborne became Chancellor – and that alone indicates where the problem lies. It says spending cuts and a lack of consumer and business confidence are restricting what we should all call “the recovery” only in mocking terms. What? It’s still supporting the discredited view that when public debt hits 90 per cent of GDP, growth is slowed? Hasn’t that idea been comprehensively rubbished – not only on paper but in the fact that UK growth hit standstill point the instant Osborne came in as Chancellor and inflicted his policies on us all? It isn’t the amount of debt that’s the problem – its the stupid things that blinkered upper-class idiots do in response! The OECD said the Labour market was “resilient”, so it obviously has been paying too much attention to DWP press releases when it should have looked up the facts. According to the Resolution Foundation (yes, another thinktank), as reported in The Independent, “The jobs market remains weak and is likely to continue to struggle well into the second half of the decade, making this a more severe downturn for employment levels than the two previous recessions”. Once again, we see the facts do not support Coalition government press releases. The OECD’s claim that average real earnings are “weak”, on the other hand, is realistic and gives the necessary perspective to a report from the Office for National Statistics that the total number of weekly hours worked across the economy hit a new record high of 950.3 million in the first quarter of the year. If everybody’s working so much, why haven’t we got any money? Answer: Because the Tory-led government has been pushing wages downwards, ever since it came into power. Average earnings for bosses of FT350 companies have rocketed upwards, but the worker on the street had a pay rise of just 0.8 per cent last year. Look at the way benefit increases have been pushed below the rate of inflation (the DWP again!) in order to make the unemployed desperate to take whatever work they can get – no matter how poorly-paid – and to put those who have jobs in fear of losing them, so that they won’t be demanding pay rises anytime soon. Back to the OECD: It wants a house-building programme to spur jobs growth. Without this, it warned that house values could overheat, sparking another price bubble. Isn’t that what George Osborne wants? Look at the so-called “second-home subsidy” he announced in the March budget, when he said the government would underwrite a percentage of new house purchases. Already we have seen warnings (from Sir Mervyn King in this Vox article) that it will create a price bubble. So not only is Osborne right; he’s also wrong. Growth is down because of his policy of cuts, but he should continue making them. Unemployment is down – but the jobs gap has grown. Also, not only is Osborne wrong; he’s very wrong. Low wages mean economy-boosting demand is also low – but the government is pushing wages down still further. House-building is needed to spur jobs growth and prevent a price bubble – but he isn’t building houses and he is actively pursuing the creation of a price bubble. That’s what the OECD report says. There’s no way Osborne should be using it to support his policies but I bet he will. If I were the secretary of state in one of the government departments he’s trying to squeeze for more cuts, I would be phoning the local mental hospital, saying a dangerous madman was loose in Whitehall and demanding that he should be sectioned. But it seems that, instead of this, the ministers who’ve dragged their feet will be subjected to a grilling by the all-new ‘Star Chamber’, which is the name for the public expenditure committee Osborne has set up. Apparently ‘Star Chamber’ has a “mystique” about it (according to The Guardian); in fact it will consist of Osborne, Danny Alexander and those ministers who’ve given in and agreed cuts, haranguing the dissenters until they fold up like cheap thugs who’ve been punched in the kidneys once too often. This is no way to run an economy. I know I used this photo very recently, but it’s the only one I feel really gets across the CHARACTER of our vampiric Chancellor. Oh look, Gideon George Osborne’s an idiot again. Or a genius, depending on whether you’re a fan of responsible government or of shrinking the State. He’s going to cut government spending by £48 BILLION in the next government spending round (The Guardian says he could increase taxes by that amount but I think we all know that’s not going to happen. 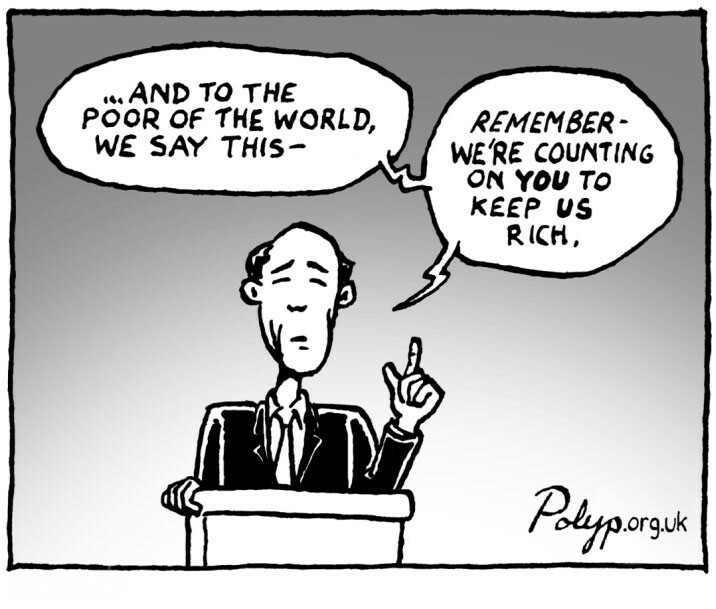 Not to the rich, anyway). It turns out the economy is weaker now than when he started – no surprises there, that’s what his policies were intended to do – so he’ll have a bigger gap to bridge when he makes his next set of multi-year spending plans. Let’s bear in mind that there will be an election around this time; we can boot this bunch of economically-illiterate lunatics back out to rot in their country estates and get someone in who actually wants to do some good. Assuming that doesn’t happen, according to The Grauniad, in addition to the deep cuts in government departmental spending for 2010-15, Mr 0 pencilled in £26 billion of additional cuts for the next spending round “to complete” – don’t laugh – “the repair work”. Obviously “repair” was a space-holding word and they were looking for an appropriate one. “Demolition” seems a likely contender to me. It turns out the UK’s structural deficit – that’s the shortfall in the public finances that will remain when the economy has fully recovered from the recession, as they love to remind us – was 1.1 per cent of GDP higher than forecast in March. So that wipes out the one per cent growth we had in the last quarter, then. Harumph. This means that the current spending round’s cuts of 2.3 per cent will be dwarfed by the 3.7 per cent further cuts required in the next one – so everything is going to plan, you see. The paper quotes Ian Mulheirn, director of the Social Market Foundation thinktank, as saying: “The chancellor will have to lay out some eye-watering cuts at the next spending review and will prolong austerity deep into the next Parliament.” Eye-watering to you, sir – MOUTH-watering to him. For those of us who know we’re going to have to pay for it (some of the poorest with their lives, I’m sure. It’s already happened in this Parliament; if the Conservatives continue into the next, it’ll only get worse) also know that it could be very different. This government has overseen and facilitated some of the worst tax avoidance fiascos in the history of, well, taxation itself, I expect. Look at the article I posted yesterday about the water companies. Look at Starbucks, Google, and Amazon, that are all having to explain themselves because they are companies owned by Johnny Foreigner. It’s all right for British businesspeople to stash your cash in tax havens abroad, but we can’t let just anyone have it, can we? Come to that, look at how gas prices are allegedly being manipulated for their own ends by the big power companies, which is the lead on The Guardian‘s website as I type this. That market is worth £300 billion, according to the paper. How much of that does the State get, and how much disappears? If I hear one more overprivileged bozo telling me it’s what the law allows I shall retch in my – in HIS – hat. The law allows it because the laws are being MADE by an overprivileged bozo – Gideon George Osborne!